If you’re anything like me you’ll love a good dog story, especially those feel-good ones of friendship, courage and love. Typically known as our best mates, the canine variety so often teach us about loyalty, responsibility and maintaining a zest for life, and these three picture books certainly contain these elements in their own gorgeous ways. 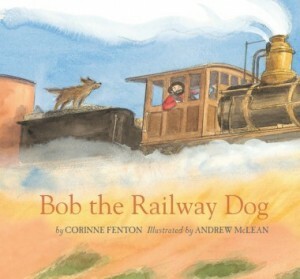 Bob the Railway Dog, Corinne Fenton (author), Andrew McLean (illus. ), Walker Books, 2015. Based on a true, moving story, Corinne Fenton uses a beautiful, poetic tone to tell of the history of the progress of railway tracks across vast Australian landscapes dating back to 1884. Bound to be rabbit hunters in outback South Australia, a cargo of homeless dogs enter the station. It is Guard Will Ferry who spots a smiling, irresistible pup amongst them – Bob. Bob becomes the Guard’s travelling companion, covering areas from wheat fields through to mining towns, all the way from Oodnadatta to Kalangadoo. For years he’d spring on and out many a train; his experiences expanded along with the tracks being laid. Bob was a part of it all. He befriended many, and even attended a range of special events like the opening of the Hawkesbury River Railway Bridge in New South Wales. Bob was a wanderer. He had spirit and gusto. He was the railway dog that everyone knew and loved, and his photograph remains at the Adelaide Station still to this day. A fascinating, delightfully written retell of an important part of Australia’s importing / exporting and travel network development, with the focal element being the adorable four-legged adventurer that brings life and excitement to this momentous tale. Matching the lively nature of the story are the watercolour, charcoal and black pencil illustrations with their fine details, movement and energy. Andrew McLean uses suitably muted colours with an almost sepia-tone representing this era with class and perfection. ‘Bob the Railway Dog’ features a strong, loveable character with extraordinary audacity. It is a great addition to any home or early years classroom with a wonderful Australian historical and social background. 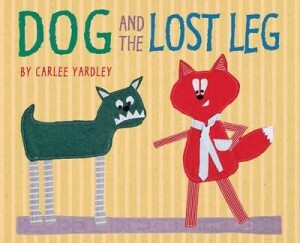 Dog and the Lost Leg, Carlee Yardley (author, illus. ), Walker Books, 2015. With its charming sewn cotton and fabric characters, ‘Dog and the Lost Leg’ is a story with plenty of humour, interactivity and warmth. It is always difficult to cope with the loss of something you’ve become quite attached to, particularly when it happens to be one of your legs! When Fox notices that Dog’s problem is caused by his missing leg, they embark on a mission to find it. Meeting other animals at their places of work, each one tries to help by offering a leg from the lost-and-found. Unfortunately, a motorbike boot from Bruno’s shop doesn’t quite fit, nor does a clawed foot from Harriet’s fruit market, and an assortment of tails from Pete the Peacock’s barber shop is definitely not right. A few giggles and some tears later, they finally approach Pip at her fabric shop. The leg that she sews looks a bit out of place, but it is perfect and puts the jiggle back in Dog’s tail. A simple storyline with simple-looking yet adorable pictures (although I’m sure they would have been a lot of work to create) contains the perfect mix of laugh-out-loud moments and those of compassion from its preschool-aged readers. I can just hear those excitable shouts of “NO!” from the audience as they are questioned, “Is that Dog’s leg?”. This book is an animated, engaging story of the case of a missing leg. With elements of problem solving, creativity, acceptance and wit, ‘Dog and the Lost Leg’ is a testament to the power of friendship and charity between diverse characters. 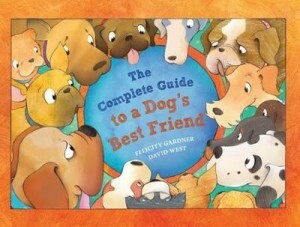 The Complete Guide to a Dog’s Best Friend, Felicity Gardner (author), David West (illus. ), Lothian Children’s Books, 2015. Here is another adorably funny book about dogs but with the inverse view of taking care of your best pet friend; the human. Contrary to most picture books, this one is written for dogs. As an explanatory, informative text, the canine narrator describes all the important things there are to be known about ‘Best Friends’. But it is the way the pictures and words work together that capture humour and depth, and truly provide an eye-opening experience into the dog’s perspective. For example, apparently it’s alright to sit on the Best Friend’s face while they sleep because it is the dog’s job to wake them up if they sleep too long. Helpful gestures include taking out the rubbish, gardening, bringing in the washing and cleaning the toilet! All depicted with those cheeky, rascally behaviours that humans get annoyed about. But those astute pooches have perfect manipulation skills – the slight head tilt and the puppy dog eyes – works every time! And, dogs, even when the Best Friends do things that make no sense (such as strange haircuts and outfits), it’s your loyalty, protection, affection and love that will always get them on side. With vivacious, colourful illustrations that feature a mixture of media including watercolour, pencil and scanned newspapers and fabrics, this book captures a real sense of warmth, familiarity and truth. It contains the best elements about welcoming and loving a pet in your family, complete with all their accompanying antics. ‘A Complete Guide to a Dog’s Best Friend’ fosters an appreciation for our pets in a heartwarming, refreshing and ‘waggish’ way, sure to be adored by anyone from age three.